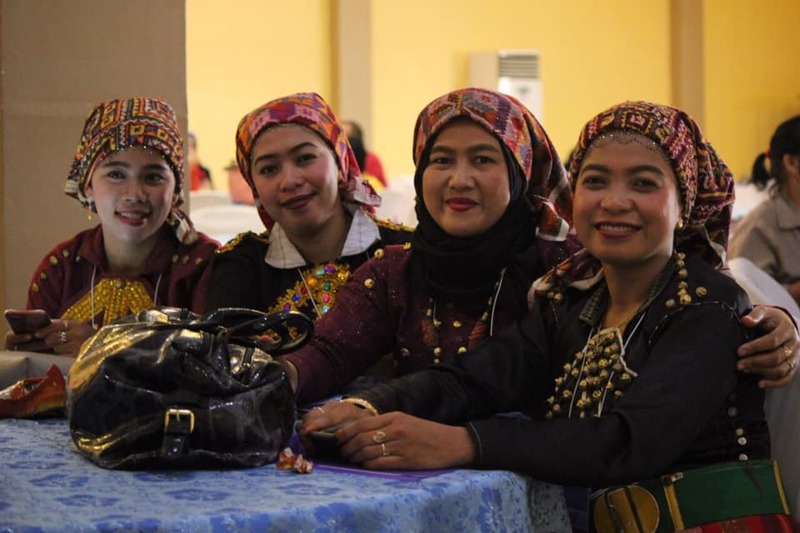 QUEZON CITY, March 20, 2019 – The beauty of the newly-established Bangsamoro Autonomous Region in Muslim Mindanao (BARMM) lies in its principle of inclusiveness and goal of serving the best interests of the Moro people regardless of where they are residing in the country. Executive Director Gloria Jumamil Mercado represented Presidential Adviser on Peace Reconciliation and Unity Carlito G. Galvez Jr in the forum which was attended by delegates coming from the different civil society organizations, academe, municipal and barangay local government units and religious sectors in the Bangsamoro Autonomous Region in Muslim Mindanao (BARMM). 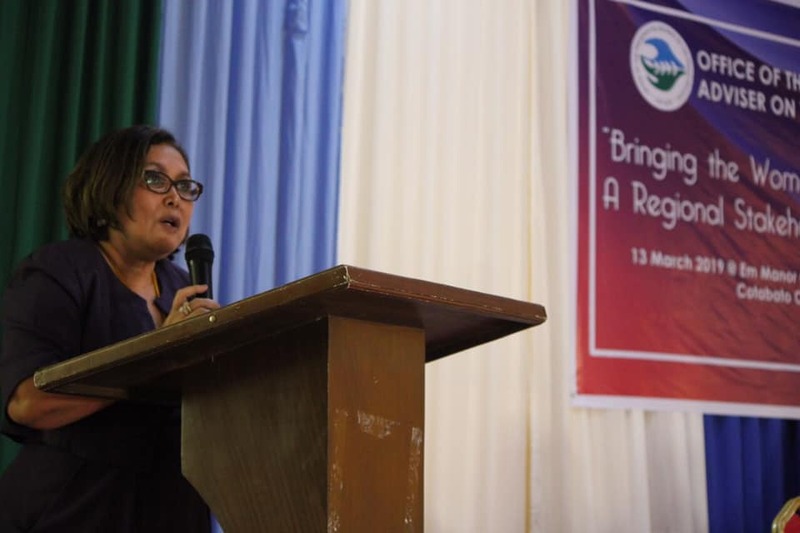 In her message, Executive Director Mercado underscored that the involvement of women in peace and development is one of the priority thrusts of Secretary Galvez in the OPAPRU. She also emphasized the invaluable contribution of women leaders in the peace process, particularly in the implementation of the Normalization phase and in the work to be carried out by the Bangsamoro Transition Authority (BTA). 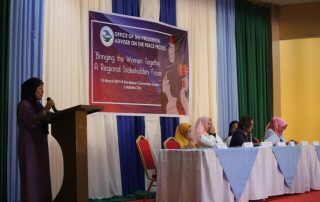 With the theme, “Bringing the Women Together: A Regional Stakeholders Forum,” the one-day forum was spearheaded by the newly-installed BARMM interim government with the hope to create safe spaces where they can speak and listen to each other in addressing key gender issues. The forum also showcased local products and cultural performances alongside workshop sessions. Discussions during the forum centered on the best practices and lessons learned in the ARMM government, as well as recommendations on how to move forward in the new Bangsamoro government. Delegates actively participated in plenary sessions, multi-stakeholder dialogues, and planning workshops. The deliberations focused on good governance practices, peace and development concerns, provision of basic social services, emergency disaster response and multi-sectoral representation and empowerment. 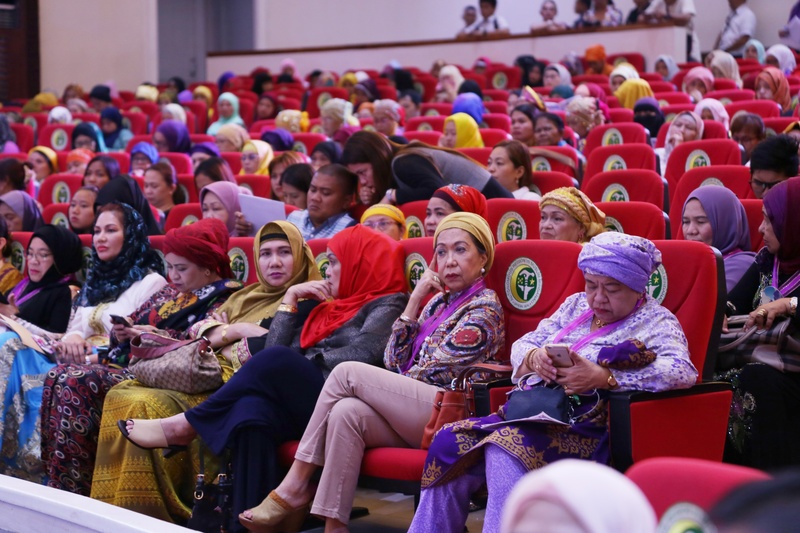 The event provided the participants an avenue to articulate their views and aspirations, as well as craft policy recommendations that would be incorporated into the Bangsamoro Women’s Agenda. The said Women’s Agenda would then be submitted to the BTA for its consideration and approval. Former ARMM Executive Secretary Atty. Laisa Masuhud-Alamia, Bangsamoro Women Chair Hja. Bainon G. Karon, former Commissioner of the Bangsamoro Transition Commission (BTC) Dr. Susana Anayatin, Atty. Anna Tarhata Basman, and Bai Shahara I. Mastura graced the event. Other presenters were former Department of Agrarian Reform (DAR) – ARMM regional Secretary Dayang Jumaide, former Executive Director of the ARMM Regional Commission on Bangsamoro Women and Sulu second district assemblywoman Irene Pungutan-Tillah and National Action Plan on Women, Peace, and Security (NAPWPS) Secretariat Head Helen M. Rojas. “Let us be an inspiration to all, especially to the young women of the Bangsamoro. 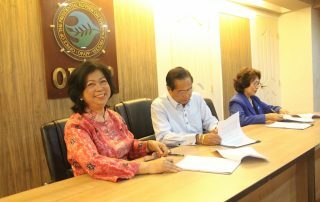 May you wield a stronger voice against injustice, violent extremism and conflict, and continue to be the women leaders who can move the Bangsamoro and the whole nation forward,” Executive Director Mercado added. 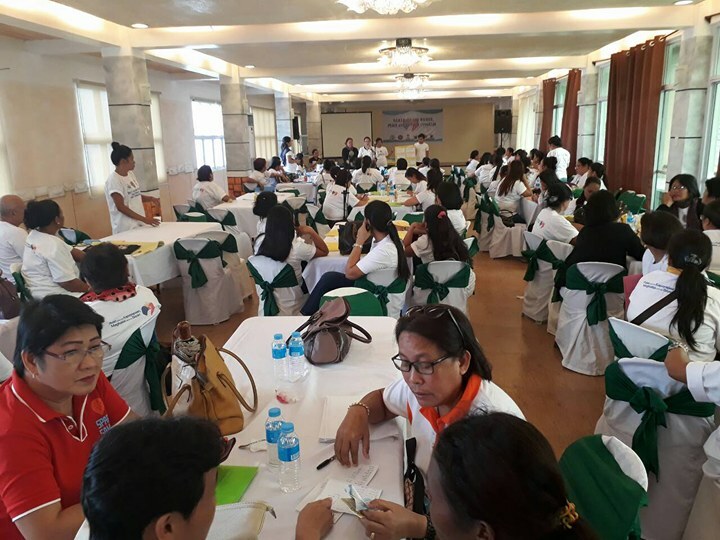 MACTAN ISLAND, Cebu, December 16, 2018 – Around 60 women leaders from the Association of Southeast Asian Nations (ASEAN) Member States gathered here in December 13, 2018 to share their narratives, knowledge, and experiences in gender mainstreaming as well as hone women’s capacities in their respective countries to contribute in building sustainable peace within the ASEAN. A fruit of the partnership between the Office of the Presidential Adviser on the Peace Process (OPAPP) and the ASEAN Women, the “Symposium on the Establishment of the ASEAN Women for Peace Registry (AWPR)” included topics on the role of women in peace and security, women’s achievements, and the promotion of respect for human dignity and human rights under the context of peace reconciliation and conflict resolution. 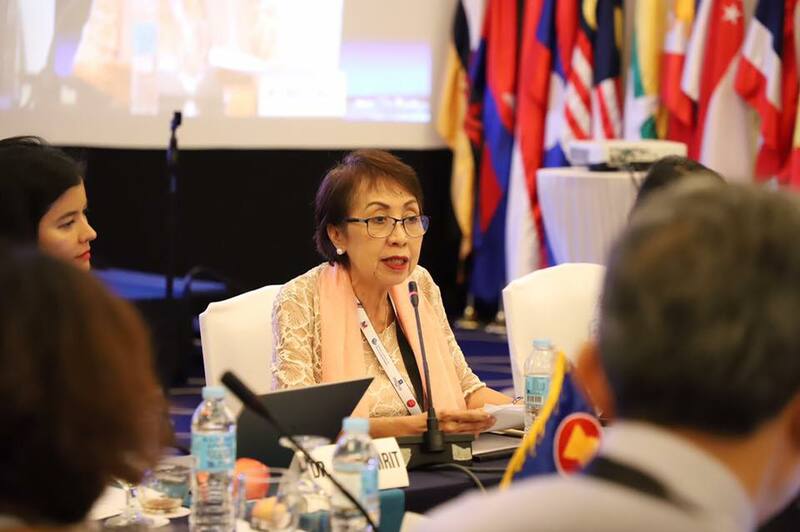 During her part on the Operationalizing the “Joint Statement on Promoting Women, Peace and Security (WPS) in ASEAN,” OPAPP Undersecretary Diosita T. Andot reaffirmed the Philippine government’s commitment on the AWPR to advance the WPS agenda in the country. 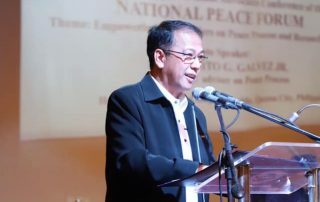 “We remain committed in ensuring that the Philippine National Action Plan (PNAP) is fully and adequately implemented particularly in the conflict affected zones in keeping with our core belief that the meaningful participation of women in various levels of governance, leadership, and in program formulation and implementation is instrumental in transforming the vulnerable sector to become valuable and viable instruments of conflict transformation,” Andot said. The symposium also identified action plans for ASEAN as well as the respective ASEAN Member States to effectively implement the Joint Statement on WPS. These included strategies to be employed for the protection of women as well as programs and activities that will strengthen and promote the interests and welfare of women and vulnerable sectors in situations of conflict. One of the main commitments of the Joint Statement was to continue addressing the root causes of armed conflicts such as poverty, discrimination, gender inequality, social injustice, economic, and social exclusion of persons and communities vulnerable to and at risk of radicalization, violent extremism, and terrorism. 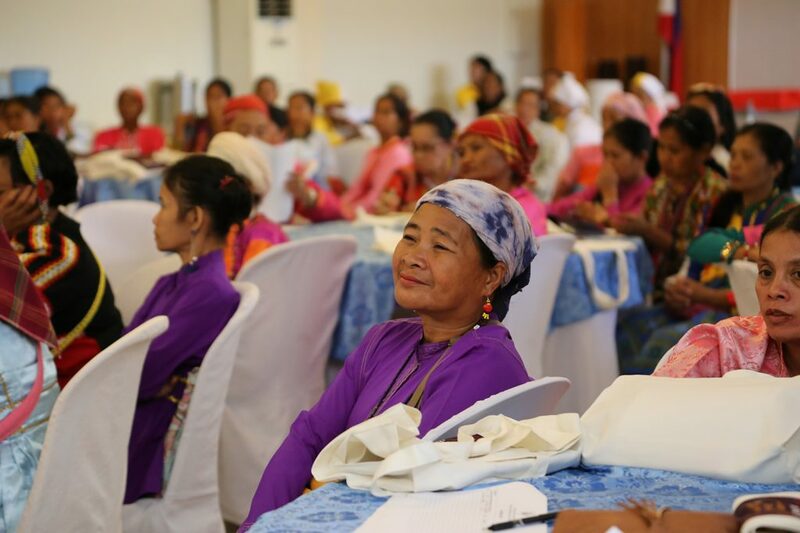 In the Philippine setting, the PNAPWPS contributed to the expansion of women’s role in the peace process, conflict transformation, and protection of their human rights in conflict situations. These were operationalized during the Marawi City siege last year which brought about the meaningful participation of women in different ways such as the formation and deployment of joint female members of the Armed Forces of the Philippines and the Philippine National Police known as the Hijab Troopers, the conduct of regular dialogues and town hall meetings from women in Marawi communities and civil society organizations, and the establishment of Women Friendly Spaces and Women Children Protection Desks. “It takes intensive networking and coordination to leverage the role of international development partners and recognize their critical contribution to advancing the WPS agenda. On this aspect, we need to improve some more and strengthen our collaboration, monitoring and evaluation.” Andot said. The event was organized by the ASEAN through its Institute for Peace and Reconciliation, in partnership with OPAPP, Ateneo de Manila University, and the Norwegian Ministry of Foreign Affairs. 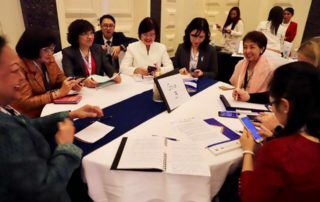 PASIG CITY, October 4, 2018 – Women peace practitioners from various Member States of the Association of Southeast Asian Nations (ASEAN) will be tapped to assist in the peace process and reconciliation efforts in the Philippines. 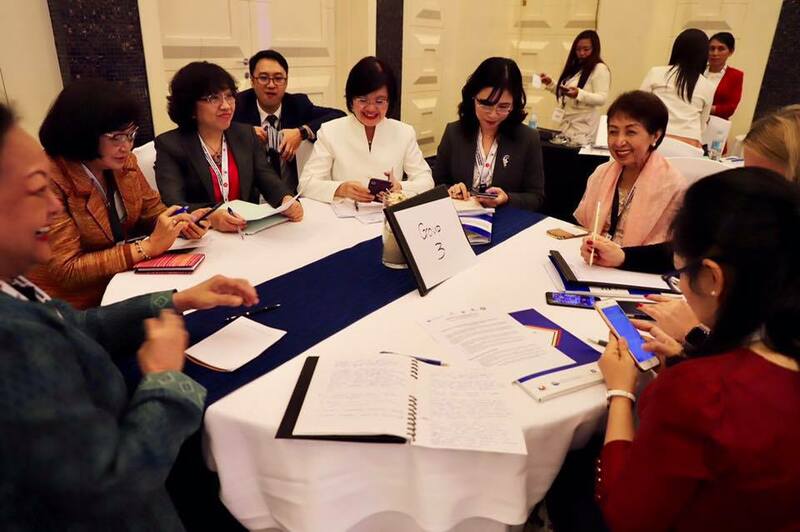 The project, dubbed “Symposium on the Establishment of an ASEAN Women for Peace Register (AWPR),” will develop a pool of experts from ASEAN Member States to be resource persons in assisting conflict management and conflict resolution activities. Set to be conducted in December 2018, the symposium aims to gather nominated women experts who will share their knowledge and experiences in gender mainstreaming, capacity building, women’s achievements, and the promotion of respect for human dignity and human rights under the context of peace, reconciliation and conflict resolution. It will also discuss the issues taken from the Joint Statement on Promoting Women, Peace and Security in ASEAN that was adopted last year during the 31st ASEAN Summit. The Memorandum of Agreement (MOA) solidifying the project implementation was signed today in this city. 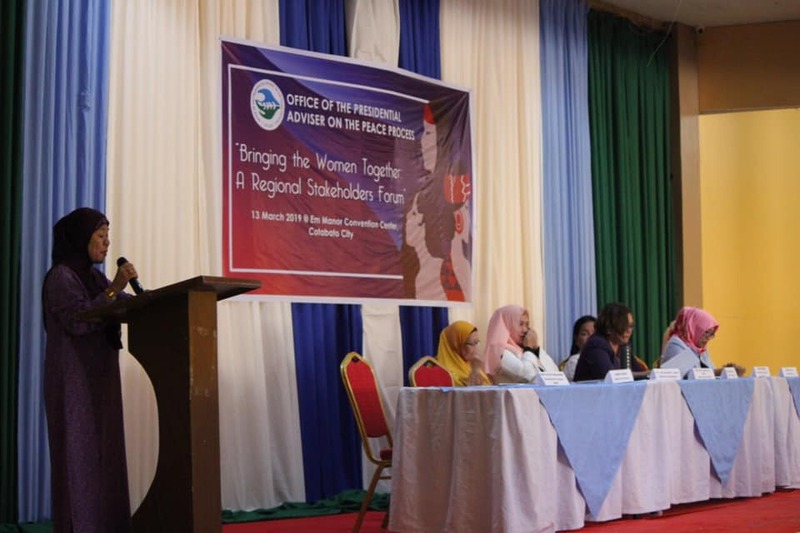 Office of the Presidential Adviser on the Peace Process (OPAPP) Secretary Jesus Dureza said he recognizes that women are not just victims of conflict but can also be active agents for peacebuilding and reconciliation. “Kailangan talaga natin ‘to (We really need this MOA) to institutionalize women participation,” he said. Dureza also thanked ASEAN-Institute for Peace and Reconciliation (ASEAN-IPR) and Ateneo de Manila University (ADMU) for their efforts in making the project a reality. “We (OPAPP) will only be there to monitor and provide support if needed, but the ball will be in your court so salamat,” he said. For its part, ADMU assured OPAPP and ASEAN-IPR of its commitment in delivering the symposium project as the implementing partner. 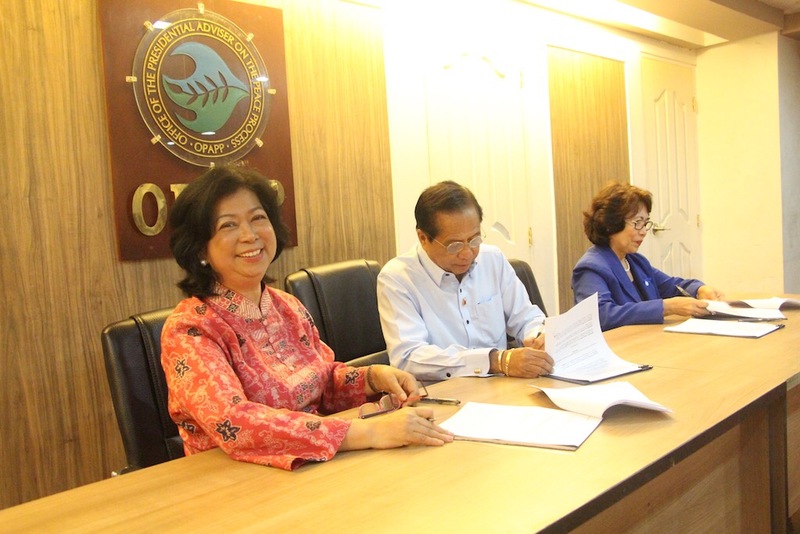 “You can trust us on our cooperation and ability to deliver, and we can assure you that what we represent here will be run very well,” ADMU Vice President for Loyola Schools Dr. Maria Luz Vilches said. The Permanent Mission of the Philippines to ASEAN is the lead proponent of the project, with an oversight function together with the OPAPP. 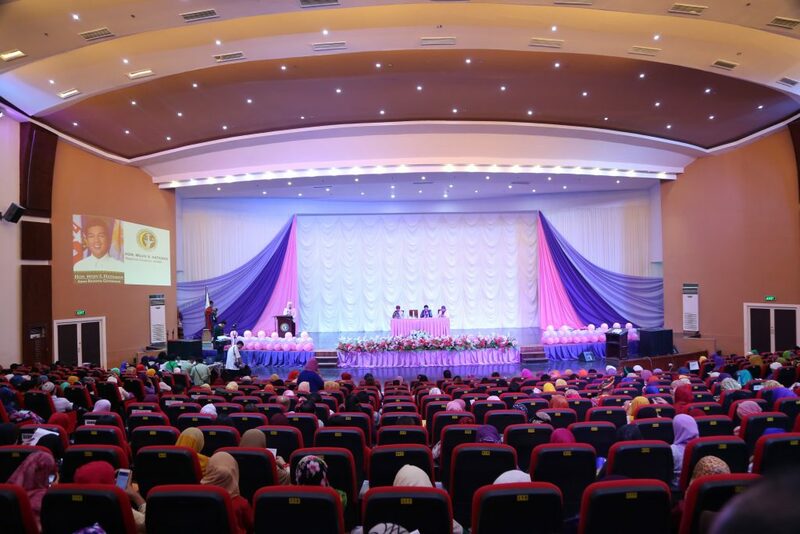 COTABATO CITY – Bangsamoro Transition Commission (BTC) Commissioner Maisara Dandamun-Latiph gave assurance of the establishment of the Bangsamoro Women Commission during her keynote message at the 2nd Bangsamoro Women Economic and Development Summit on March 14, 2018. “I assure you, there shall be a Bangsamoro Women Commission created by the parliament to promote women’s rights in the Bangsamoro. Women should finally stake their claims in the table,” Latiph said in her message. She also said 50 percent of the available positions in government service must be occupied by women and that women’s seats in the interim government and the Bangsamoro Council of Leaders should be guaranteed as well. Latiph said the primary actions of women should be about empowerment so that they are informed of their rights and provided with trainings and strategies that contribute to women’s inclusion and participation in governance and peace building. “We are here because we are strong and we survived. ‘Wag po tayo mahiya na umupo sa lamesa. Dapat po tayo mismo have our place dahil kung hindi tayo, sino? Nasa inyo po if we want or reject change (Let us not be afraid to sit on the table. We ourselves should have a place there; if not us, then who? It’s up to you if want or reject change),” she said. 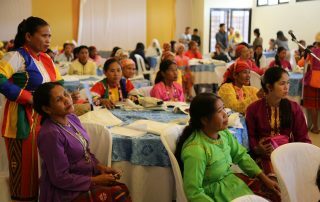 The 2nd Bangsamoro Women’s Summit is a two-day consultation among Moro women, non-Moro indigenous women, civil society organizations, and government agencies aiming to strengthen constituency support on the passage of the Bangsamoro Basic Law (BBL). It also provides an avenue for discourse on insights regarding Moro women’s political participation in governance, peace building, and development. 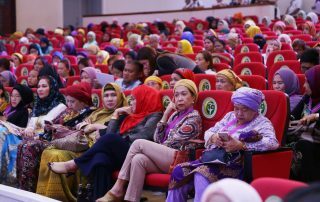 It is a collaborative activity of the Office of the Presidential Adviser on the Peace Process, Regional Commission on Bangsamoro Women, and Commission on Elections in celebration of the National Women’s Month. 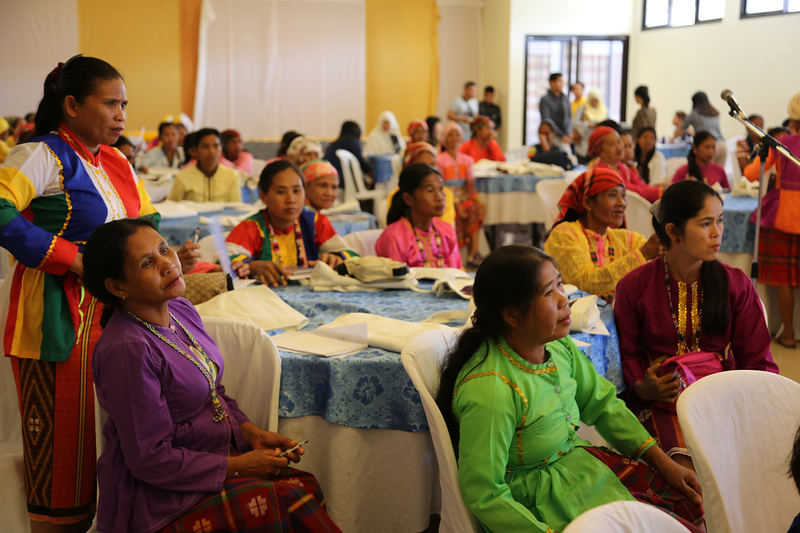 COTABATO CITY – Indigenous women in the Autonomous Region in Muslim Mindanao (ARMM) were equipped with knowledge about their rights and the mechanisms available for their protection during the Indigenous People Women’s Summit held today in celebration of the National Women’s Month. 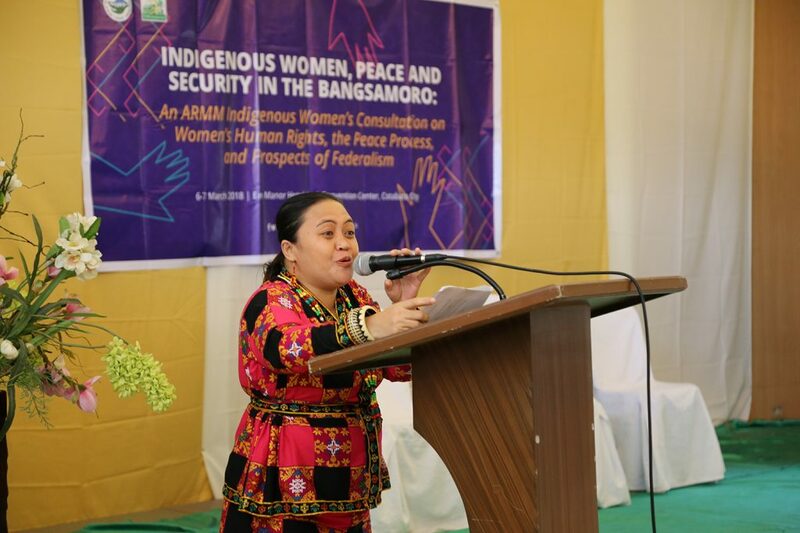 Regional Commission on Bangsamoro Women (RCBW)-ARMM Chairperson Sittie Jehan Mutin explained that the Regional Action Plan on Women, Peace and Security (RAPWPS) 2017-2019 provides a platform for IP women to voice out their concerns. The RAPWPS 2017-2019 was developed based from the assessment conducted by local agencies that identified the most imminent issues of women in their communities. “We need to ensure that they [IP women] have access, linkages and networks so that we become their voice as IP women in ARMM. They are very much welcome to work with us, and our entry point for now would be the RAPWPS. We are hoping that not only would these women become beneficiaries of RAPWPS but also partners for implementation.” Mutin added. In addition to the RAPWPS, Mutin cited the Magna Carta of Women, ARMM Gender and Development (GAD) Code, and the Regional Sub-Committee of GAD (RSCGAD) as legal instruments in protecting the IP women’s rights citing provisions that recognize and respect the IP cultures and practices. The Regional Human Rights Commission (RHRC)-ARMM stressed that all women – IPs or not – should have equal access to human rights. “From the time na pinanganak tayo, ang ating human rights nage-exist na. Saan ka man galing, ano man ang ‘yong kulay, pare-pareho tayo ng karapatan. Remember: there is no such thing as right to violate rights,” said RHRC Maguindanao Head Atty. Norpaisa Paglala. The two-day consultation further discussed the current situation of IPs in ARMM that identified poverty, cultural barriers, armed conflict, lack of legal remedies, environmental degradation, and gender health issues as amongst the common challenges being faced by the IP communities in the highlands. Teduray and Lambangian Women’s Organization Executive Director Froilyn Mendoza said in order to address these challenges, people should first recognize the distinct identities of the IPs. They should also protect indigenous political structure and customary laws as well as the pursuit of institutional support to address their concerns. 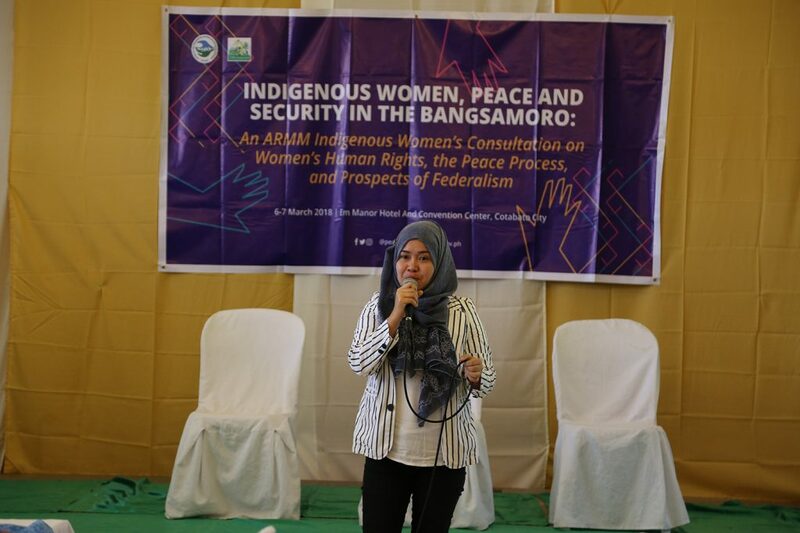 The two-day consultation revolved around the theme “Indigenous Women, Peace and Security in the Bangsamoro: And ARMM Indigenous Women’s Consultation on Women’s Human Rights, the Peace Process and Prospects of Federalism”. This is part of the collaborative activities between the TLWOI and the Office of the Presidential Adviser on the Peace Process (OPAPP). 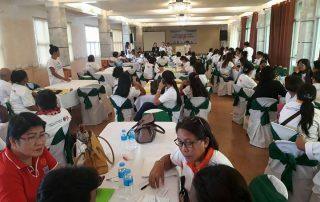 Congregations based here in Samar convened representatives of the women and youth sectors from various parts of the island on 25 September as part of the series of activities in line with the celebration of the National Peace Consciousness Month. The Samar Island Women Action Network (SWAN) for Peace and Development on Monday conducted a forum that discussed the issues being faced by Samar women and proposed recommendations on how the Office of the Presidential Adviser on the Peace Process (OPAPP) – in upholding the principles of National Action Plan on Women, Peace and Security (NAPWPS) – can help alleviate their struggles. Amongst the challenges raised were livelihood opportunities and their funding, lack of access roads, child labor, disaster preparedness, security vulnerabilities and lack of health facilities on far-flung areas. SWAN President Myra Tambor expressed her gratitude that OPAPP considered Samar as the fourth stop for their ‘Peace Buzz’, a symbolic caravan that travels on different areas from Luzon to Mindanao to advocate the culture of peace. “Ang maganda sa congress na ‘to, sila [women] mismo dito sa community sector ang nag-identify ng mga problema nila. ‘Yong pag-identify ng issues nila na hihingan ng solusyon mula sa OPPAP at marinig ni Secretary [Dureza], malaking bagay na po ‘yon sa’min,” Tambor said. In addition to women empowerment, Presidential Adviser on the Peace Process Secretary Jesus Dureza also acknowledged on his keynote message the vital role of youth on the peace process and implementation. “‘Yong beneficiaries, ang makaka-enjoy ng trabaho natin ngayon for peace ay ang mga kabataan. The reason why involved kayo [youth], ay dahil kaming mga matatanda na are like old dogs who are difficult to learn new tricks. 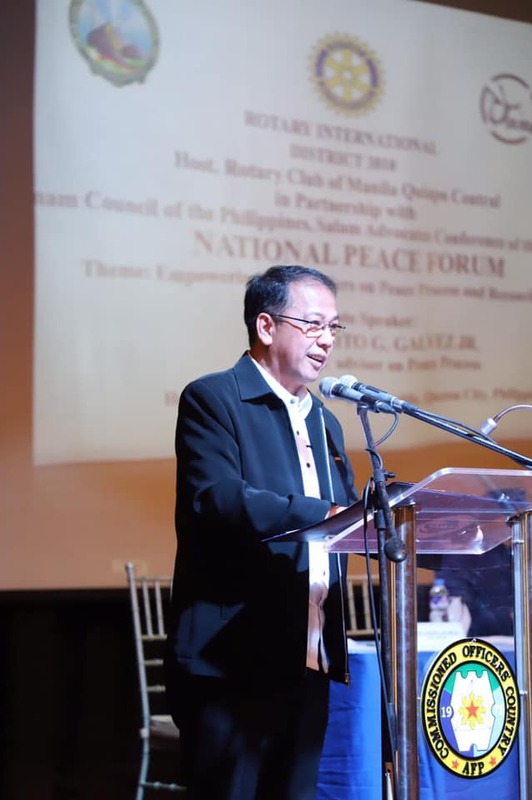 Kaya napaka-halaga na ‘yong mga kabataan natin will really work for your own future, especially for peace,” Secretary Dureza stated. The women and youth forums had a total of 118 and 110 participants respectively from 15 municipalities of Samar Island. The two groups were merged for an oath-taking ceremony as Peace Ambassadors on the latter part of the program, led by Miss World Philippines Top 10 and Peace Ambassadress Cristina Marie Coloma. Not just advocates, but champions. This was how the first batch of Women, Peace and Security (WPS) Speaker’s Bureau was described by Undersecretary Diosita T. Andot of the Office of the Presidential Adviser on the Peace Process (OPAPP) during the Training of Trainers held on 31 July to 03 August in Tagaytay City. Norilyn Rivera is a planning officer at the Department of Social Welfare and Development (DSWD) for nine years but in the course of her service, supporting for women’s rights was more than just that. “Ang motivation ko talaga is maraming tao ang naghihintay ng serbisyo ng gobyerno. It’s really a commitment na eto na, nabibigyan ako ng opportunity for learning. Kailangan kong ibalik ‘yon kasi maraming naghihintay,” Rivera shared when asked about her insights during the workshop. 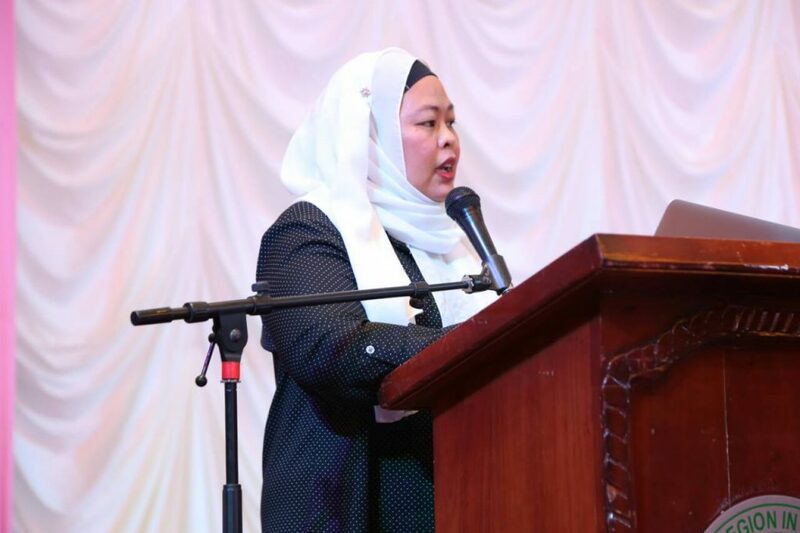 Commissioner Aisha Malayang of the National Commission on Muslim Filipinos (NCMF) also shared how her personal experience brought her closer to embrace the vision conveyed in the National Action Plan on Women, Peace and Security (NAPWPS). “I am a convert to Islam in 2003 and when I changed my faith, kasabay din do’n ‘yong sandamakmak na discrimination. Nandiyan ‘yong tanggalin ako sa trabaho dahil naka-hijab ako … so I can resonate well with others who share the same narrative,” she stated. Rivera and Malayang were just some of the 64 trainers capacitated during the four-day workshop. 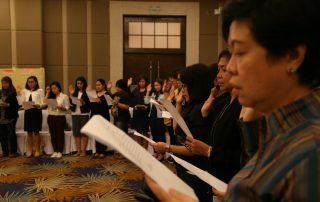 The activity started off from a story-telling about the concepts and history of NAPWPS since its development in 2010, down to the formation of a “solidarity circle’’ symbolizing the firm commitment that all participants took oath on its last day. Academic analyses identified the Philippines as the first country in Asia to adopt a National Action Plan, highlighting its uniqueness on the long-term implementation spanning from 2010 to 2016. Its formulation was a result of a collaborative effort between the government and various civil society organizations since 2007. In 2010, Executive Order No. 865 was signed leading to the creation of the National Steering Committee on Women, Peace and Security and on that same year, the first NAPWPS framework was launched. Further enhancements focusing on the streamline of NAPWPS action points and indicators resulted in the crafting of its second generation framework in 2014. This was subsequently used in the 2015 baseline research on the implementation of NAPWPS initiatives entitled: “Women, Peace and Security: A Study to Implement United Nations Security Council Resolution (UNSCR) 1325”. Now on its third generation, the new NAPWPS framework integrated the Convention on the Elimination of all forms of Discrimination against Women (CEDAW), CEDAW General Recommendation 30, and 2015 Global Study on the Implementation of UNSCR 1325 that underscore women’s leadership and participation on the peace process as well as its strengthened mechanisms for women’s protection during and after conflict. However, the capacity building was just one step closer to a bigger WPS platform. Foreseen challenges on its information dissemination down to the local government units, budget allocations, monitoring and on-the-ground implementation were among the points raised during the workshop. Nonetheless, the WPS champions asserted their determination on the successful rollout of the new framework. For instance, NCMF Commissioner Malayang shared how their agency will take part an “active role in the advancement of the NAPWPS agenda” as well as acknowledging the importance of cascading it down to the regions especially to those with conflict situations. 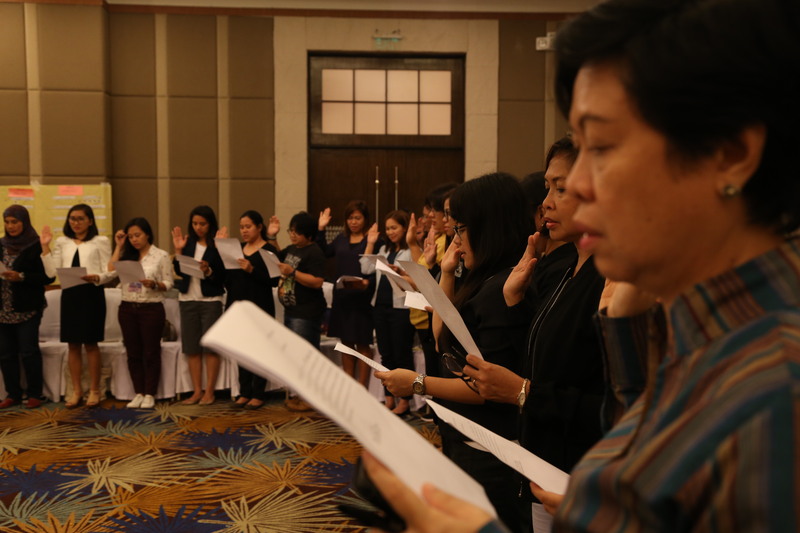 The same sentiment was shared by Rivera, who expressed that harmonizing the principles of NAPWPS into the mission of DSWD would help them further understand the sensitivities and situations being experienced by women especially on fragile areas. “Kung ie-espouse mo ‘yong NAPWPS sa GAD (Gender and Development) makikita mo na bibigyan mo siya [women] ng livelihood and economic opportunities, pero ang lensing mo on WPS, bibigyan mo rin siya ng venue to participate sa usapan kung paano mare-resolve ang conflict na ‘to,” Rivera said. The workshop concluded in positive outlooks as Jasmin Nario-Galace, one of the workshop facilitators, shared her hope in the advocacy that the WPS champions would be pursuing. “The women have always been marginalized, always been thought as victims, their voices invisible. It’s high time that we highlight their agency: that they are seen not just as survivors – but also agents of peace,” she said. The Office of the Presidential Adviser on the Peace Process (OPAPP) spearheaded the training of trainers that will implement the National Action Plan on Women, Peace and Security (NAPWPS) 2017-2022 held on 31 July-03 August 2017 in Tagaytay City. 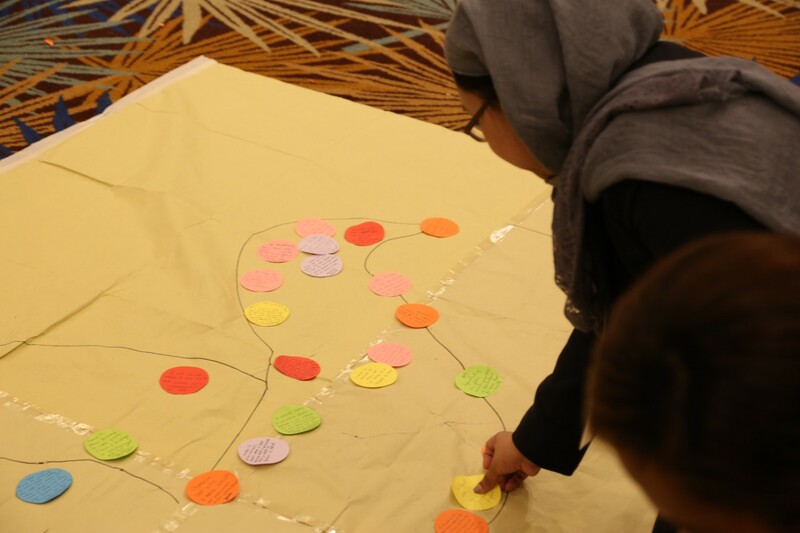 The third-generation NAPWPS framework is envisioned as the state’s cornerstone in promoting women’s rights, needs and roles in peacebuilding, peacekeeping, and peace negotiations. The recently held strategic planning and workshop had produced 64 capacity builders stemmed from various government agencies. Moreover, its first batch of trainers were tapped as the official representatives of the NAPWPS steering committee and technical working group in cascading the policies and guidelines of the program from national government agencies down to local government units. “We trust that with the organization of the WPS Speaker’s Bureau, coordination between and among agencies is strengthened especially on matters of women empowerment and protection,” expressed OPAPP Undersecretary Diosita Andot. The new framework had integrated the Convention on the Elimination of all forms of Discrimination against Women (CEDAW), CEDAW General Recommendation 30, and 2015 Global Study on the Implementation of UNSCR 1325, which further highlighted the participation and leadership of women in the peace process as well as its strengthened mechanisms in protecting women during and after conflict. “’Pag alam mo na ‘yong lens ng Gender and Development espousing with Women, Peace and Security, mas culturally sensitive ka na at the same time, magzu-zoom in ka na ang babae, mas high-risk talaga in times of conflict,” shared Norilyn Quesada-Rivera of the Department of Social Welfare and Development (DSWD) regarding her insights from the four-day workshop.